Alex has spent a lifetime in the sewing industry and is considered one of the foremost experts of pioneering machines and their inventors. He has written extensively for trade magazines, radio, television, books and publications worldwide. Over the last two decades Alex has been painstakingly building this website to encourage enthusiasts around around the Globe. 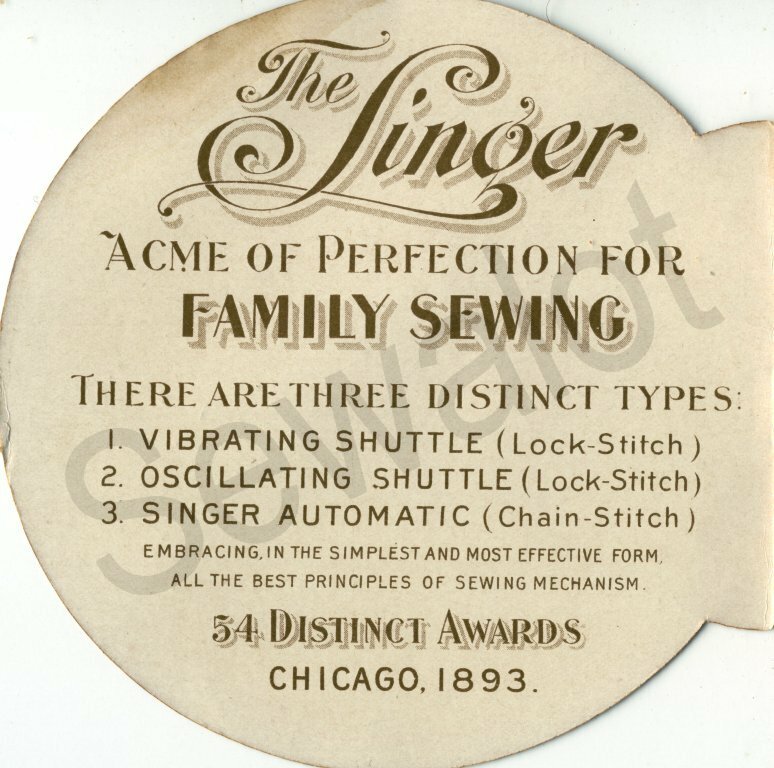 Very little has come to light over the years about the beautiful Singer 24 chain stitch. I have constantly kept an eye on the market collecting useful snippets, information and pictures. I thought that it was about time I put them on the Internet to share with you. I do hope you find it useful and hope that there will be people out there will add more information as time goes by. To my knowledge the amazing Singer 24 was the only model sold by Singers that was promoted as a toy, an adult machine and an industrial too. The machine fitted a niche market, small pretty and robust it was built to the highest engineering standard available. Sold as a treadle, hand or belt driven industrial it was a cracker of a machine. 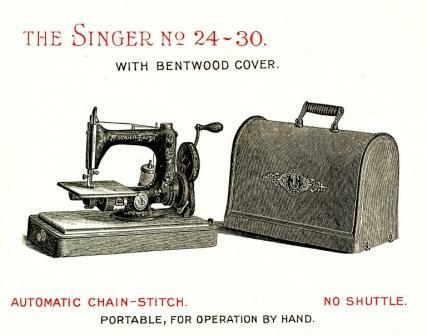 The Singer model 24 was made by Singer to compete with the popular Willcox & Gibbs chain stitch model that had dominated the market since Victorian times. 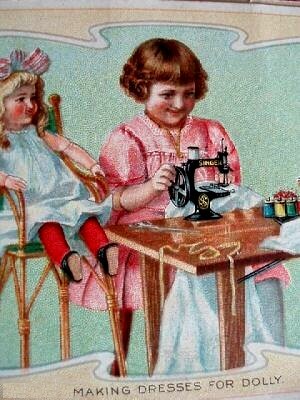 This small machine, not much bigger than many toys, uses a single thread to produce a simple chain stitch. Over the decades the Singer 24 had at least 70 variations, all minor so you would instantly recognise the Singer 24-4 and the Singer 24-71 as the same machine. If you think that Isaac Singer started with his model A, then model 1, 2 and so on you can see where the Singer 24 fits into the Singer range. The Singer 48 came out around 1890 and the Singer 24 pre-dates that by a few years. It was fist patented on April the 13th 1886. Very few of these early models turn up but the ones that do show how Singer's copied several great ideas from the world leading Willcox & Gibbs chainstitch. 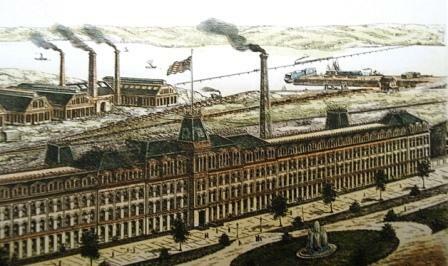 By 1886 all of the important early patents had expired that Willcox & Gibbs used so Singer's were free to copy the best. This is the most sought after of the rare Singer 24's the perfect small hand machine and very pretty. I have just one in my Sewalot collection. 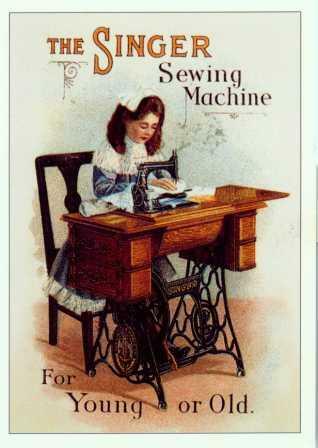 The machine was popular with hat makers and lace makers. It was a great favourite with the Luton hat manufacturers in England as it had good clearance under the arm, perfect for their straw boaters. It was often bench mounted and shaft driven by a single steam or electric engine and power supplied by pulleys, shafts and belts. 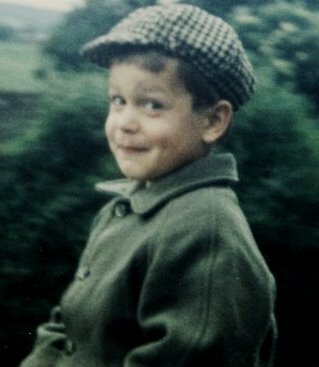 I have a lovely little piece on the Luton Hat Trade by someone who actually worked there. 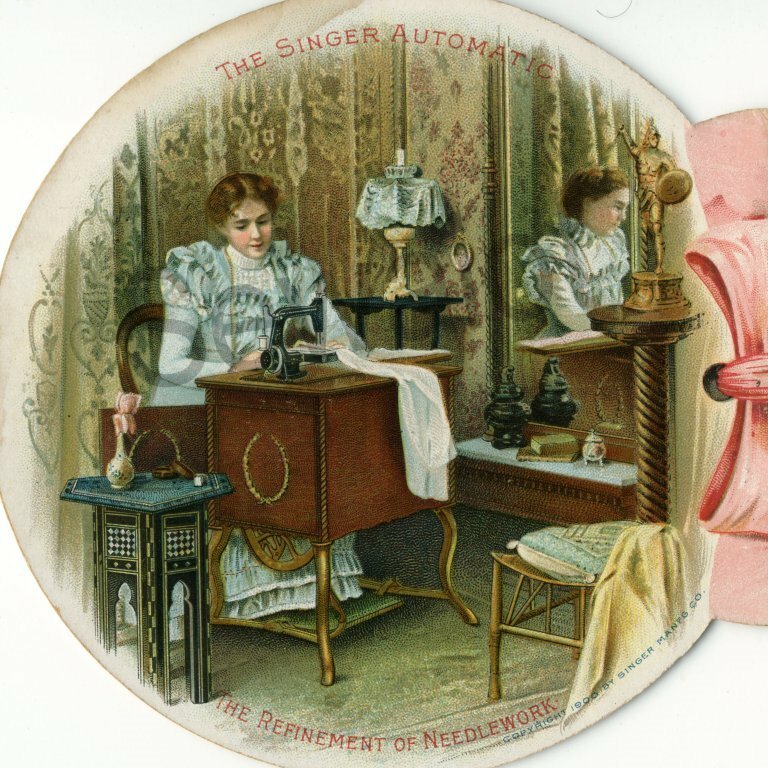 The Singer 24-23 pleater-friller for frills often around hats and awards, rosettes etc. The machine is almost silent in operation and very smooth using a single hook to pick up the thread and twist it into a stitch invented by James Gibbs when he was just 24. The machine was so well made that it needed no modification when used on an industrial table. Apparently it could sew up to 3,000 stitches a minute. Pretty impressive for a machine that was sold as a toy and as an adult machine as well as a small travelling machine. 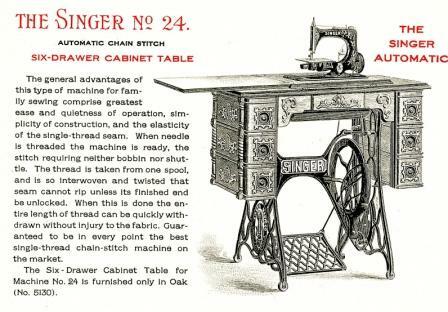 The Singer model 24 may be the only machine that was sold in every class of sewing machinery without change. To my knowledge the 24’s were produced in Elizabeth, New Jersey, USA. Some of the later Singer 24's have an unusual front adjustable tension, unlike the “Auto” ones. The model 24 ran with few changes from the late Victorian period right up to the 1940’s when even electric models were offered. Ease, quietness and simplicity the Singer 24 had a lot of appeal and sold for decades though is quite rare today. The Singer 24 is almost silent in operation and very smooth. The 24’s were produced in Elizabeth, New Jersey, USA. The model 24 ran with few changes from late the late Victorian period right up to the 1940’s. Hey I hope you are concentrating I just wrote that twice! 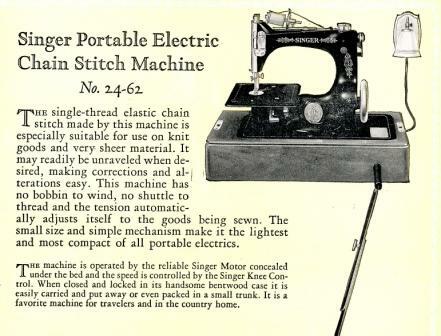 Interestingly there is also a Singer model 30 chain stitch, very similar and very rare. So now we ask the question. Why did Singer produce the model 30? They had a perfectly good chainstitch in the Singer 24 already. 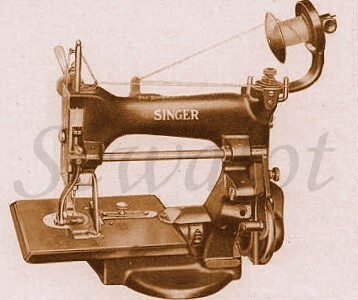 The Singer 24 produced an elastic chain stitch identical to its biggest rival the impressive Willcox & Gibbs. Here is an early electric model with a knee speed controller and light. Circa 1925-1935. The Singer 30 was made at Kilbowie on the banks of the river Clyde in Scotland, Great Britain. It could have been to temporarily fill a gap in production at the giant factory that had to keep upwards of 16,000 workers busy. All the Singer 30's that I have come across have a 1913 manufacturing date. 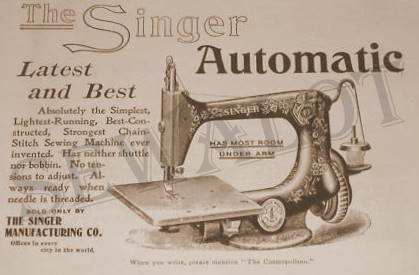 Maybe a lull in production saw the opportunity to make a British Singer chain stitch machine. What we do know is that it did not last long. In 1914 the Great War erupted and 20 million men went to their deaths. After the war the deadly pandemic, Spanish Flu, wiped out another 22 million. The Singer model 30 was simply forgotten, production ceased. However in America the Singer 24 hand model continued with bentwood case. It is the most sought after and the prettiest of the models that they produced. A real stunner. I only have one in my collection and cherish it. Once a year I get it out and oil it then run a piece of fabric through to make sure it sews well. Incidentally the Singer 24 takes the same needle as the singer 30 and many of the Singer toys which is a 24x1 code. It is a short, stubby flat-sided needle and nothing but the original will work properly. Because the Singer 24 was the first model the needle was marked from then of 24x1. Now, while we are on the subject of the Singer chain stitch machines we cannot go without mentioning the perfect Singer 20. 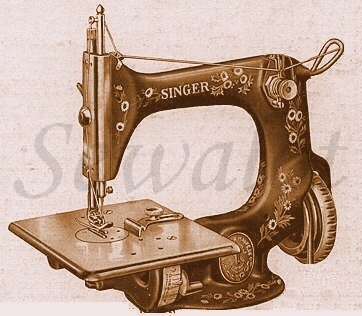 The most successful toy sewing machine ever produced was the Singer 20. Now that is a pretty impressive statement-but-true. The machine ran from around 1910 until the 1970’s with only minor changes. The Singer model 20’s were also made at the Elizabeth factory in New Jersey, USA, and were originally sold as toys. 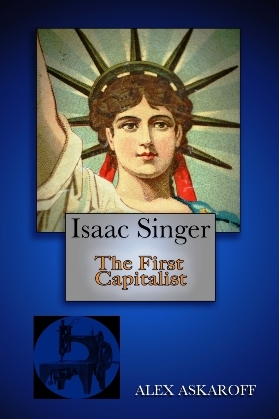 First appearing around 1910 some 60 years after Isaac Merritt Singer founded the great Singer Manufacturing Company. Later they were resurrected in Turkey where a few more were made. Once again identical. 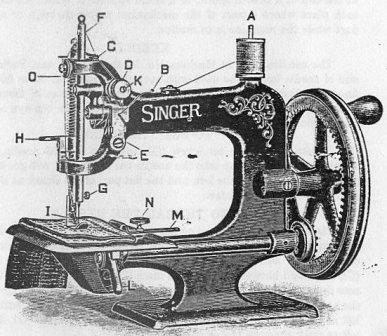 Early models of the Singer 20 were clearly aimed at the child market however later models were sold as adult light portable machines as well as toys. This was probably to gain a foothold into the larger market of full-sized machines. The Singer 20 produces a simple chain stitch. 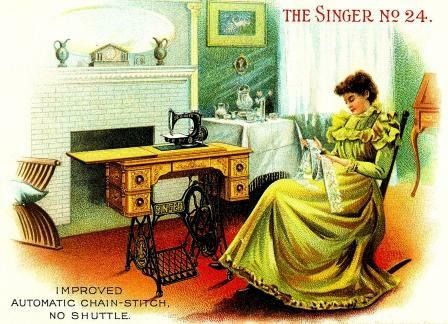 Over the years as the patents ran out the Singer 20 was one of the most widely copied of all small sewing machines. The well-made cast iron machine was durable, long lasting and has become prized among collectors world-wide, especially the different coloured models. In Britain the main makers were Grain and Essex. And so my friends I come to am end of the Singer 24 and what little I know about this diamond. Values have shot up in recent years and as they get rarer and older I expect they will keep rising. Well that's it, I do hope you enjoyed my work. I have spent a lifetime collecting, researching and writing these pages and I love to hear from people so drop me a line and let me know what you thought: alexsussex@aol.com. Also if you have any information to add I would love to put it on my site. Just wanted to thank you for your very informative notes on the Singer 24 on your website and for your love of old sewing machines. Thank you for all the endless hours that you must have spent building these amazing pages Alex. Alex Great pictures and information. Well done. Thank you again for all the useful information you give freely to us.